Fearless Leadership: Joshua is a 12 week men's Bible study course on the life of Joshua. It is the fourth of 12 study books, part of the Men of Purpose series by Dr. Gene Getz. These studies have a unique blend of group interaction, discovery Bible study, and biblical principles for living developed over years of ministry by Dr. Getz.The Men of Purpose Series focuses on men in the Bible who are poignant examples of Godly masculinity. Each of these leaders faced trials, frustration and failure, yet was inspired by God to achieve great goals. In a world where Christian male role models seem increasingly rare, this series reminds us that some of the most worthy examples of godly character can be found in the biblical figures who brought power, wisdom, and inspiration to God's people. 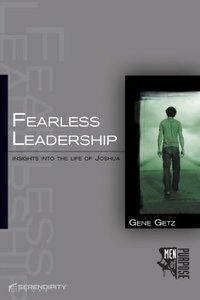 About "Fearless Leadership - Joshua (13 Sessions) (Men Of Purpose Series)"
Dr. Gene Getz, a graduate of Moody Bible Institute, has been involved in a variety of experiences, including Christian education, music ministries, and college and seminary teaching. He has authored more than fifty books and has directly or indirectly helped launch seventeen churches in the Dallas metroplex. Currently, Gene serves as senior pastor of Fellowship Bible Church North in Plano, Texas; director of the Center for Church Renewal; host of Renewal Radio; and adjunct professor at Dallas Theological Seminary.